For those of you who like graphic novels, I have a treat for you today. A few years ago Jennifer Holm and her brother Matt Holm started creating graphic novels about a mouse character called Babymouse. The main character, Babymouse, is a middle schooler who has a powerful imagination, and who has the tendency to get herself into unfortunate situations.The books are incredibly funny, and the authors make their tales interesting by having Babymouse interact with an unseen narrator, who knows Babymouse and her ways all too well. Today Babymouse is going to the library. While she is getting a book that is on a tall shelf, she loses her balance and grabs a pipe that just happens to be on hand just when she needs it. Unfortunately, the pipe is part of the fire sprinkler system. It breaks, and the library becomes a disaster area. In response to this “flood,” the school teachers decide to have a fundraiser to replace the water-damaged books. Babymouse has not had much luck with raising funds in the past, and she is not very thrilled about the fundraiser, until her teacher announces that to raise funds the kids will be selling cupcakes. What could be better! After all, Babymouse is a cupcake aficionado, and the top fundraiser will win a special prize. 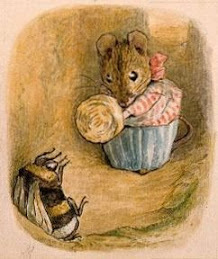 Despite her abysmal fundraising record, Babymouse sets about trying to sell cupcakes. True to form, she has a singular lack of success. How can she compete with Felicia, who has an advertising agency at her disposal? Babymouse fans are sure to be delighted with this adventure. As is typical with Babymouse, her dreams (conjured up by her vivid imagination) far outstrip her ability to get what she wants. This time though, Babymouse’s lack of success ends up being her trump card. Who can resist a mouse who continues to dream, even after having so many…er…setbacks. With its pink, black, and white graphic novel format, its loveable main character, and its cupcake filled pages, this is a book readers of all ages will enjoy. In today's book, Bill Thomson tells an extraordinary story without any words at all. His artwork is a joy to look at, and readers of all ages will appreciate the meticulous attention to detail that he uses in all the illustrations. One day, three friends are walking through a playground on a rainy day. As they come up to the dinosaur spring rider, they see that someone has looped the handles of a gift bag over the dinosaur’s teeth. Naturally, the children are curious to see what is in the gift bag. When they look inside the bag, they see that it is full of big sticks of colored chalk. One of the girls takes out a stick of yellow chalk and she draws a picture of a sun on the road. To her amazement, a shining sun blazes up from the road and soon it is up in the sky driving all the rain-filled clouds away. The second girl takes out an orange stick of chalk and she draws butterflies on the road. In no time at all, the three children are surrounded by fluttering monarch butterflies. The little boy takes a green stick of chalk out of the bag. Hmmm. He has an idea. He has an idea to draw something fabulous. Could it be that his idea is perhaps it is not so fabulous after all? For this simply gorgeous picture book, Bill Thomson has created luminous illustrations that are rich with detail. He takes an ordinary rainy day and turns it into a day that is full of magic and adventure. Young children will enjoy narrating the story in their own words, and they will appreciate the fact that the story ends where it began. Today's book tells the story of a very intellectual mouse who does not know much about friendship. He knows that he wants a friend in his life, but he has a lot to learn about what it takes to be a good friend. Professor Frank Mouse is a very clever inventor. Working alone in his home in the shed, Frank makes and mends all kinds of things. One day Frank looks outside and he seems that many animals are making and mending things, just as he does. The difference is that they, unlike him, are not alone. They have friends and family members to help them. Poor Frank is too shy to try to find a friend of his own, so he does the next best thing. Frank sets about making a friend for himself, and soon – after much hard work – his friend, Teddy, is all ready. Frank is delighted with Teddy, though Teddy wishes he were more handy and more able to join Frank in his making and mending work. One day, when Frank is out, Teddy tries to “make something by himself” as a surprise for Frank. Poor Teddy is so clumsy that the only thing he is able to make is a mess. What will Frank think when he sees what Teddy has done? In this delightful picture book, we meet a very intelligent mouse who has a lot to learn about friends and friendship. Thankfully, he creates Teddy, who has a big heart, and who knows all about how to make friends. With warm and often sweetly funny illustrations, and charming characters, this picture book is a title that children will want to look at again and again. Today's Poetry Friday selection is a book that explores the many forms that poets use to write poetry. Using examples, the author shows readers that there are a lot more forms than most people are aware of. Many of us think that poetry comes in two forms - free verse and rhyming verse. In actual fact poetry can come in many different forms, and some poems may use different forms from stanza to stanza. In this very special book, readers are invited to explore twenty-six different forms, from A to Z. Yes indeed, there is a poetic form whose name begins with the letter Z. There is also one whose name begins with X - Xcogito. In this form, the poet tries using "experimental" rhymes for words "which cannot be rhymed by traditional means." Every parent knows what it is like when a child loses or misplaces a beloved stuffed animal. Tears flow, frantic searches take place, and nothing is quite right until and missing toy is found, safe and sound. Today's picture book tells the story of one teddy bear who has an extraordinary adventure when he is accidentally lost. Mother is taking Baby for a ride in his stroller along the beach. When the stroller bounces over a little red crab, Bear is “bounced” out of the stroller and onto the boardwalk. Baby is naturally distraught, and Mother looks for Bear, but she cannot find him and she continues her walk down the boardwalk. Unfortunately, for Bear, a dog finds him and carries him onto the beach, where he leaves the toy to be carried off by a wave. A sailor in his boat sees Bear “barely afloat” and he tries to rescue him, but his efforts come to naught, and Bear is carried down, down, down into the “deep ocean” by a playful seal. Any child who has lost a much-loved toy will appreciate this picture book with its engaging rhyming text and its luscious pencil and watercolor illustrations. It is interesting to see how many adventures the bear has, and how, in the end, the bear ends up where he belongs. American Girl's 2011 Girl of the Year. A few years ago I got my daughter her first American Girl doll. She chose Samantha, a doll whose stories take place in the Edwardian era. We collected the books that go with the doll, which I read to her, and had a blast finding outfits and accessories that suited Samantha's time. I was able to use the doll to teach my daughter about what it would have been like to live in America at the turn of the century. We talked about women's rights, the treatment of working class people, and the class system that existed then. A few years after we got Samantha, someone gave my daughter their Molly doll and I was able to share the history of the WWII years with her through Molly's stories. This year American Girl is launching a new doll. Her name is Kanani, and her stories will focus on the need to care for others. Here is the press release about this new doll, her books, and America Girl's partnership with the National Wildlife Federation. ALOHA, KANANI! AMERICAN GIRL’S 2011 GIRL OF THE YEAR HAILS FROM HAWAI‘I! This January, kicking off American Girl’s 25th birthday celebration, is the debut of Kanani Akina, the 2011 Girl of the Year®, whose story takes place in the lush tropical paradise of Hawai‘i. A warm and cheerful girl, Kanani loves her town’s beautiful beaches, tropical sunsets, and fun lu‘aus, but most of all, she and her family love sharing the aloha spirit—a desire to welcome and care for others with an open heart. Through Kanani, girls will discover that everyone has something to share that can make life better for someone else. Written by acclaimed author Lisa Yee, the 2011 Girl of the Year books—Aloha, Kanani and Good Job, Kanani—introduce readers to Kanani and her small seaside town on the island of Kaua‘i. Kanani loves working in her family’s shave ice and sweet treats store, as well as sharing the wonders of Hawai‘i with visitors. Whether she’s making her cousin from New York feel welcome on the island, helping rescue a baby Hawaiian monk seal, or assisting older people in her community, Kanani learns that by sharing herself and her home in the true aloha spirit, she is able to make life better for others. The back of each Kanani book features profiles of real girls who, like Kanani, discover the joy of helping others through their gifts and efforts, however small. To share in the Hawaiian spirit of helping others, American Girl is partnering with the National Wildlife Federation (NWF) to help raise awareness of endangered animals, like the Hawaiian monk seal featured in Kanani’s stories. With the purchase of every Kanani plush monk seal sold in 2011, American Girl is donating $1 (up to a maximum of $100,000) to NWF’s efforts to help children throughout the United States gain an appreciation and understanding for America’s most vulnerable animals through various educational programs and activities. « Lend a Hand: Girl-Sized Ways of Helping Others: A nonfiction companion advice book to the Kanani fiction series, Lend a Hand gives girls ideas and tips (both big and small) for making a difference at home, among their friends, in their community, and on the planet. « Kanani Retail Events: Starting on January 1, girls can take part in Kanani-inspired events at American Girl retail stores nationwide, including demonstrations for dancing hula, free Hawaiian craft activities, and delicious Kanani-themed meals. « Kanani and Me E-cards: From January 1 through April 15, 2011, girls can create and share their own Kanani-themed postcards at americangirl.com/girloftheyear and can be automatically entered (with parent’s permission) in a drawing to win a Kanani doll and book. 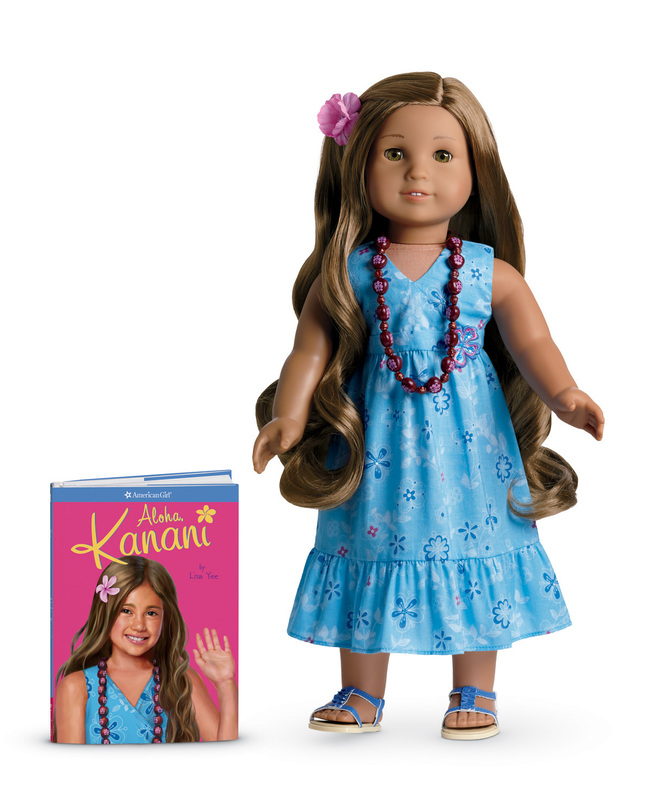 Starting on January 1, 2011, the Kanani doll, books, and accessories will be available for one year or while supplies last through American Girl’s catalogue, at americangirl.com, and at all American Girl retail locations. To request a free American Girl catalogue, call 1-800-845-0005. National Wildlife Federation is the nation's largest conservation organization and publisher of the award-winning children’s magazines Ranger Rick®, Your Big Backyard®, and Wild Animal Baby®. National Wildlife Federation inspires more than four million members and supporters to protect wildlife for our children’s future. For more information, visit www.nwf.org. Friendship, just like almost everything else in life, takes work. Today's picture book tells the story of two young animals who discover that life really is better when you have a friend to share it with. Even the best of friends sometimes have a falling out. It happens. Though Pig and Rabbit have a great deal in common, they are upset and want to prove that they don’t need each other. Children who have gone through a similar experience, will completely understand how two friends can so quickly fight, and how they can equally quickly reconcile their differences. With wonderfully expressive mixed media art, and a minimal but meaningful text, this book is perfect for young children who are learning how to navigate the sometimes tricky waters of friendship. Not long ago I was driving past a field full of cows here in Ashland when I saw that there was a peacock sitting in a tree above the heads of the browsing cows. I was so startled by this rather peculiar sight that I almost drove into a ditch. I could not for the life of me figure out why there was a peacock in a cow field in southern Oregon. Where did it come from? I was therefore delighted to receive a review copy of today's picture book, which is about a peacock that causes quite a stir on a farm. Life on the Tucker farm is peaceful and “nothing unusual” happens there. The cows chew their cud, the hens cluck, peck, and lay eggs, and the old hound snoozes on the porch. Peace and quiet reigns. Until the day when a box falls out of a van, and peacock steps out of the box. The animals on the farm behave the way their normally do, but the peacock – who has never lived on a farm – starts to shriek. The peacock stands by the side of the road shrieking and showing off his spectacular tail feathers, and people who are driving by stop to take a look at the bird. They get out of their cars, take photos of the peacock, and buy corn, tomatoes, and eggs from the Tuckers. The peacock loves the attention, and the Tuckers are very happy because business is “booming.” However, the hens on the farm are furious. They are livid that they are doing all the work and the peacock “gets all the attention.” With angry hens complaining, and a miserable peacock moping around, the atmosphere on the farm is most uncomfortable. What is to be done about this situation? Readers of all ages are sure to be entertained when they read this delightful picture book. Not only is it very amusing, but it also looks at something that we are all, on occasion, are guilty of doing - wishing we were in someone else’s shoes. In this case, the chickens wish they were in the peacocks…er…feet, and vice versa. Sometimes being who and what you are is actually the best thing to be. I know that some people hate mice. I had a friend who could face a charging rhino (she was that kind of person), but who completely lost it if she saw a mouse. I am one of those people who quite likes mice, and I have reviewed a lot of picture books that have mouse characters in them. Here is a new title that I was quite charmed by. Who could resist the baby mouse in this picture book. It is time for mouse baby to go to bed, and his daddy is looking for him. It is time for games of hide-and-squeak to end, but mouse baby is still full of beans, and he has no intention of making it easy for his father to catch him. Around the garden mouse baby “dashes,” with his father in hot pursuit. Through the mouse hole in the back door mouse baby runs. Mouse baby hangs from the table lamp cord, he perches on the little hand of the clock, and he jumps into the bubble filled bathtub. Doggedly Daddy follows, catching a glimpse of a tail here, and the tips of whiskers there. How long will it be before this mousey game of hide-and-squeak comes to an end? With its clever rhyming text and its cunning illustrations, this is the perfect book to share with a child at bedtime. Children will instantly bond with the little mouse child, and parents will appreciate the mouse father’s patience and tenacity. I have reviewed several wordless books over the last few weeks, and I have another one for you today. Today's book features Polo, an incredibly sweet dog character who will quickly endear himself to young readers. Polo the little dog is going fishing. He puts on his backpack, swings into his boat (which saves him getting his paws wet) and soon he is standing on his boat with his line in the water. Polo greets a flying fish when it jumps over his little boat. He is horrified when an angry looking orca also decides to jump over his boat. The whale makes a huge splash, and Polo’s boat is carried far away on the crest of a huge wave. The wave is so enormous, that Polo and his boat are deposited on the top of a tall hill in a distant land. A mysterious bear gives Polo a flute, and then it disappears into thin air. What follows is a series of increasingly bizarre events. In this delightful Polo adventure, the little dog takes a journey that is unusual, interesting, and magical. Children will quickly fall in love with Polo, and they will want to ‘read’ the rest of the books in the series. Search-and-find books are hugely popular these days, and with good reason. They keep young readers busy and engaged for quite a while. The Where's Waldo books are particularly good search-and-find titles, and today I have a review of the first book in the series. A few years ago a very unique character called Scaredy Squirrel stepped onto the picture book scene. I quickly fell in love with the multi-phobic squirrel who is afraid of just about everything. Here is a review of his newest book. Scaredy Squirrel is a very cautious animal, which is why he has never had a proper birthday party. Every year he celebrates “alone quietly up in his tree,” because he does not want to have a party on the ground and risk “being taken by surprise.” After all, everyone knows that the ground is a dangerous place. Scaredy is all ready to mail his birthday party invitation to himself (and only himself), when he discovers that Buddy has sent him a birthday card. Touched by Buddy’s kindness, Scaredy decides to invite him to his birthday party. Buddy is a dog, so Scaredy is going to have to move his party from his nice safe tree to the ground below. This is going to require careful planning, and he sets about making sure that his party is not ruined by the arrival of bigfoot, ants, clownfish, ponies, porcupines, and/or a superfluity of confetti. He also works on safe topics of conversation, the dos and don’ts of partying, and a detailed party schedule. Scaredy is sure that he has got all the bases covered, but it turns out that he has failed to take one very important possibility into consideration. This hilarious Scaredy Squirrel title will have readers chuckling in no time. There is no doubt that Scaredy, with his fear of anything that is not planned and under control, is a character who is both appealing and loveable. Young readers will enjoy looking at the unique format that Melanie Watts uses, and they will love the way the story takes a very unexpected turn. For today's poetry title I have a collection of haiku that are unique and often very funny. As they read through this book, children will enjoy exploring this interesting poetry form . When my daughter was little, she used to 'play' with Reeka, one of our dogs. Reeka is a very gentle soul, and she tolerated my daughter's attentions with stoicism and good grace. Today's picture book is about another dog who has to put up with a loud and rambunctious little girl. This wonderfully amusing picture book serves as a tribute to all the many dogs who have had to suffer at the hands of little children. With his courtesy and gentle ways, Mr. Dash is the poster dog for good manners, and in the end, he shows even Daphne that dogs should be treated with respect. I love people watching. When I was a child, I used to go to town with my father and we would sit in a cafe and make up stories about the people who walked by. We would wonder where were they going, and what were they doing in town. Now I play this same 'game' with my daughter. We find that airports and cafes are great places to people watch. Today's picture book is about a little girl who is watching the world go by from her balcony. Yael is a little girl who likes to stand on the balcony of her home. From the balcony on the second floor, she can look into the street and watch the world go by. Here comes a little dog who is wagging his tail. Busily he jumps, turns around, and barks. Then the little dog trots down the street, and Yael wonders where the little dog has gone. Later on, Yael sees something else coming down the street. She “peeks between the railings” and she hears someone whistling and ringing a bell. Who is it Yael wonders, and then she sees a man riding a bicycle. He is wearing boots, and he has a basket and a fishing pole on the back of his bicycle. Yael wonders where the man is going and what he will do when he gets there. This charming picture book shows young children how interesting it is to observe the world around them. The narrative encourages them to try to guess what the animals and people that they see in the story are up to. Where are they going and what will they do next? With wonderful, brightly colored illustrations throughout, this is a picture book that young children are sure to enjoy. Today's picture book is the kind of book that adults as well as children will appreciate. It conveys a message that is relevant to readers who are 7 or 17 or 27 or... I think you get the idea. It is the kind of book that gives you something new to think about every time you read it. As you go about your days, you will discover that there are so many doors that lead to somewhere, and there is so much “to wonder about.” You don’t know who you will be, nor do you know “where you will go.” Life is so full of unknowns. In this remarkable book, Alison McGhee’s lyrical text is perfectly matched to Taeeun Yoo’s multimedia art to help young people to see that everything they need to make their way in the world is within them. In their hearts, they will find courage, strength, hope, and love, all the tools that they will need during their journey to somewhere. This book would make a wonderful gift for anyone who is embarking on a journey of some kind. Life can be hard when something about us looks different, when we don't look like everyone else in some way. We went to fit in, and we feel that our differentness is a liability or a trial that we have to bear. This picture book take a look at how one little cat discovers, with a little help from her friends, that being different isn't that bad after all.